The cable for the cable car fell into the gorge, but the swing that goes over the gorge is still in good shape. Come visit- your dollars will help us rebuild! The Royal Gorge Fire is now 100% contained, and they just announced the birth of a white buffalo. Maybe this is like a rainbow at the end of a storm. An indication that Mother Earth wants to give us a break, if we’ll let her. On a human note, the 41 year-round employees at the park have retained their jobs, but the seasonal ones had to be let go until it is rebuilt. 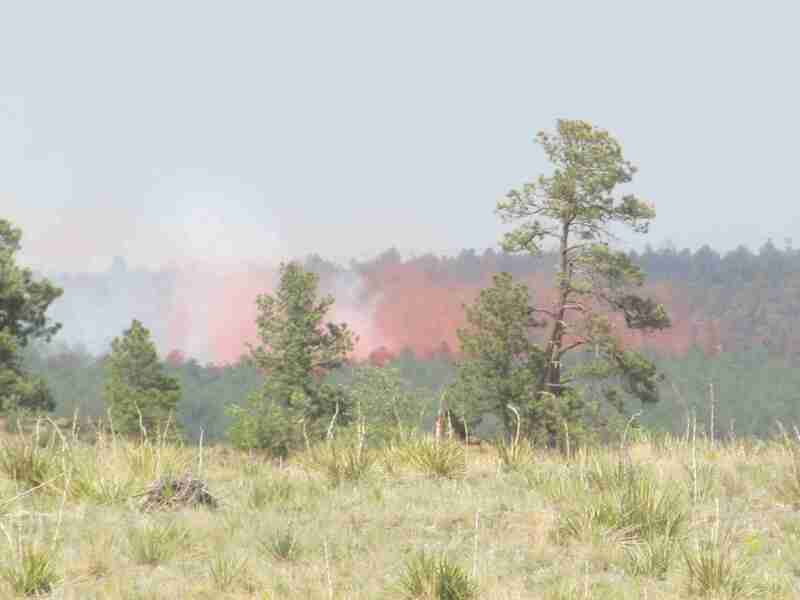 Our fire, up in Black Forest, is at 75% containment, and they are letting more people return home. They are hoping that the people in the hottest zones will be able to go home for a visit tomorrow, even if they can’t yet return permanently. 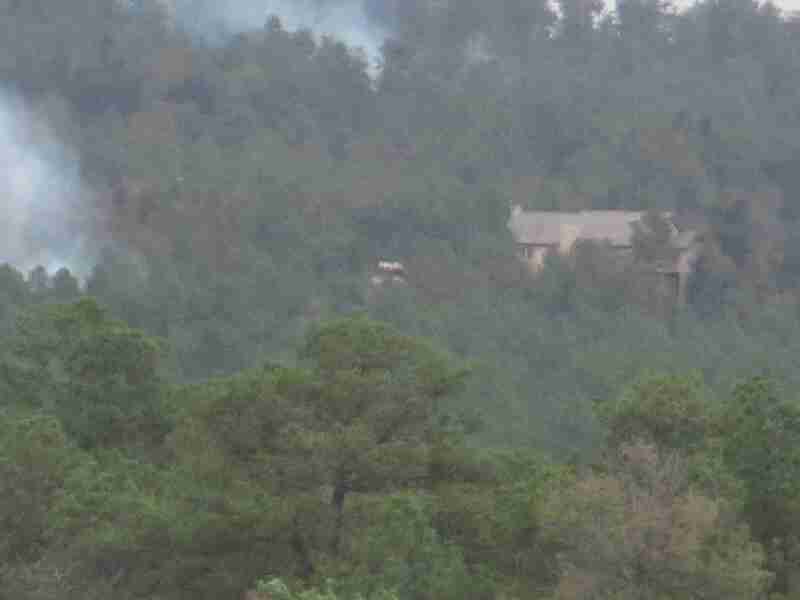 The houses lost are holding steady at 482, and the fire hasn’t grown in a couple of days. We have had a thunderstorm every afternoon, once they started, which is helping to smother the fire. Unfortunately, thunderstorms come with lightening, and I just heard that there might be a new, small fire east of town. Even with daily rain, it is still very, very dry. Containment, however, does not mean it’s out. It just means that they are pretty sure it won’t cross the established fire line. This fire was apparently a “dirty” fire, in that it didn’t burn out all the fuel in the section it went through. That means that there are untouched trees and houses within the containment area. In other words, it doesn’t have to get any bigger to do more damage. The way this fire burned, it was snaking along the ground through the duff under the trees as often as it was hopping from tree to tree. The hot spots are harder to see if they’re buried in the pine needles and such that make up the duff under the trees. The firefighters will be making three “cross-hatches” across each area before it is declared safe. To do so, they will be literally walking across the area in a line, then moving the line 90 degrees to walk across it a second time in a new direction. That is one cross-hatch. The plan is to have a new set of firefighters do each check just so that nothing is missed. During the updates, it was pointedly noted that the houses that had “defensible space,” as had been requested, were more likely to be saved. When I have been up in Black Forest, I couldn’t help but think that it felt like Maine without the water. “Without the water” is important. I love living under trees, and you can get away with that in Maine or in other places where the average water content makes fires rare. Around here, as too many homeowners discovered the hard way, living right under trees means that it is way too easy for the fire to jump from a highly flammable tree to a highly flammable house. As much as firefighters want to save every structure, they have to weigh their own safety and the likelihood of success before they enter the fray. If the fire is up in the trees, and there’s no space between the trees and the house, they simply cannot do anything about it. As people move in from the coasts, they have brought in the trees and grasses that they know best. What they couldn’t bring was the moisture. A development here looks depressingly like a development almost anywhere. Unfortunately, this lulls people into forgetting that the environment in Colorado is harsher than many other places. I was looking at the scar from the Waldo Canyon fire when I was out doing errands, and I couldn’t help but think that while we want to think we can bend the world to our will, in the end, the world will only be bent as much as she allows. She may have reached her limit for Colorado. The burned trees right beside the unburned trees is a stark reminder that fire is part of our world. 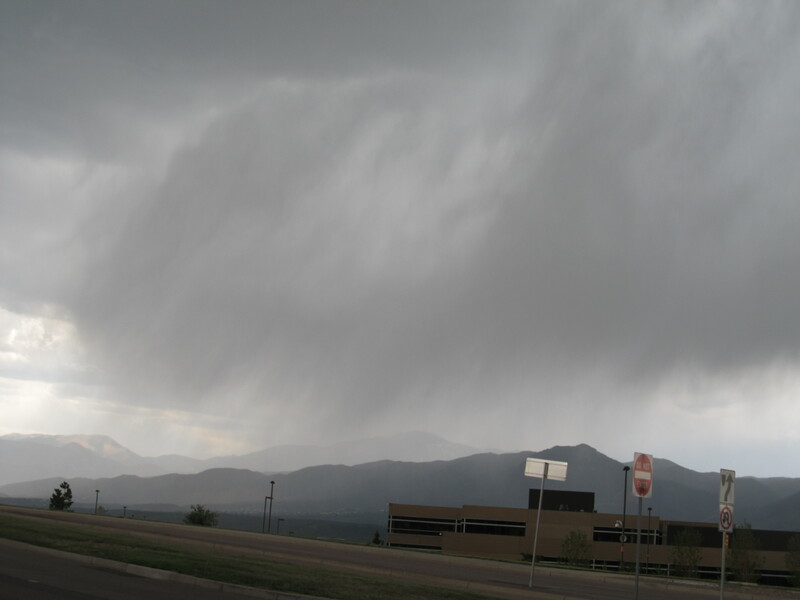 Colorado does this awesome (read, potentially annoying) thing where it precipitates by zip code. It might rain in the mountains, but nothing in town. It might rain in the north part of town, but not the south part. You can see here, rain where I am, but blue sky not so far away. I headed out to Falcon to see if I could get some pictures of the eastern side of the fire. 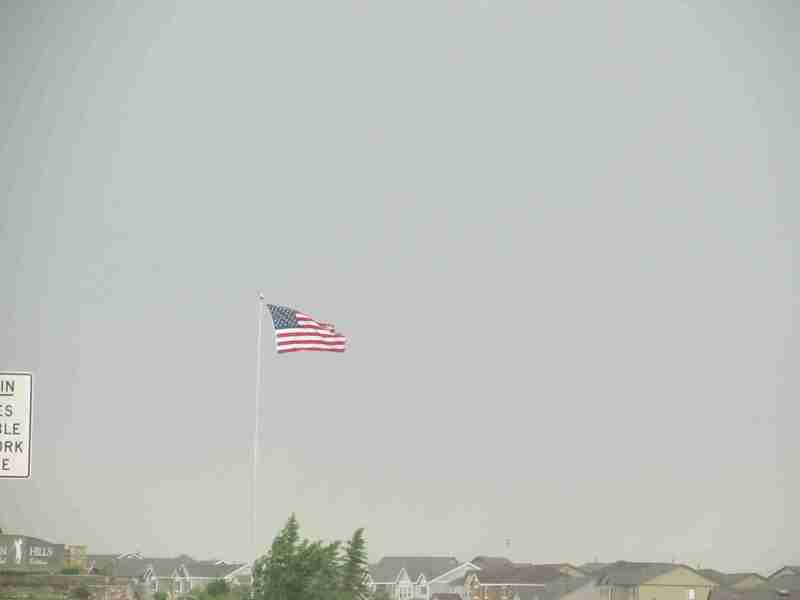 You can see how windy it is from the thunderstorm. My camera and I aren’t fast enough to get lightening pictures, but we had that, too. You can also see the development in the bottom of the picture. 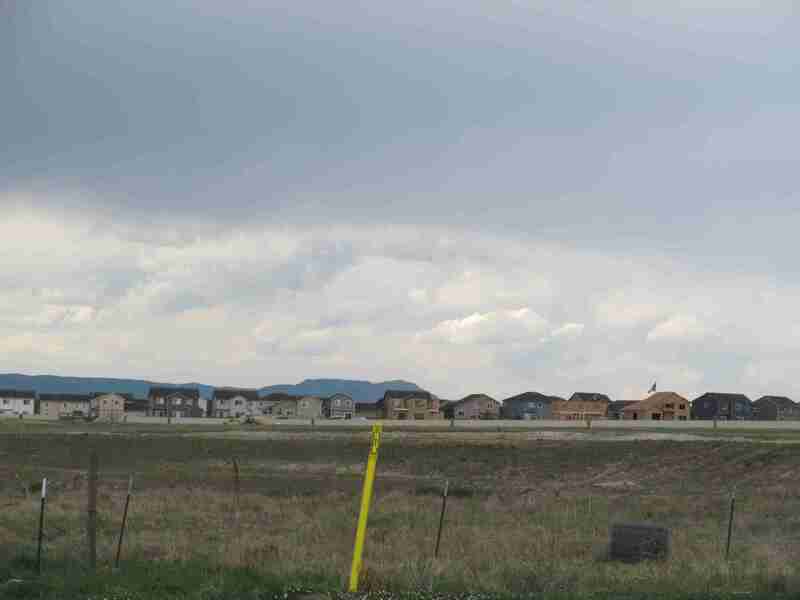 As you head east out of town toward the plains, you tend to see either open farm/ranch land or housing developments. Sadly, those are usually on old ranches because selling to a developer is more lucrative than farming or ranching. Between the clouds and the road blocks, I didn’t get anywhere near the fire. However, I’d rather have the weather finally helping with controlling the fire than awesome smoke and fire pictures. 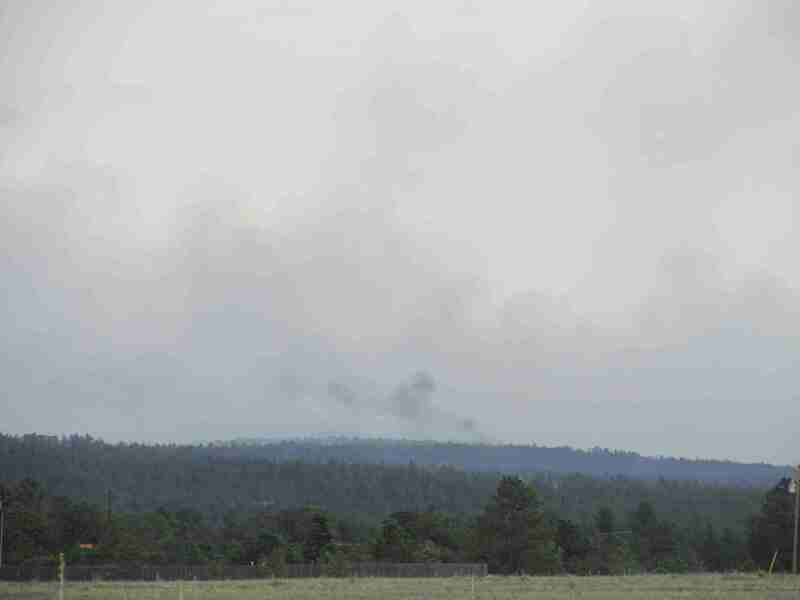 In tonight’s update, they were very clear that while the rain was helpful, the fire is far from out, and it wouldn’t take much at all to return to the hot, dry conditions that were fanning the fire earlier in the week. However, the cloud cover, higher humidity, and brief rain shower did help the firefighters make some headway. We are up to 30% containment, and some of the mandatory evacuations were revised down to pre-evacuation status. The count is up to 400 homes lost, but 2,833 are fine. They have about 5,000 more to check in the mandatory evacuation area. It is very tragic for each of the 400 families who lost their home, but the ratio of buildings lost to buildings saved is impressive. Many thanks again to all of the people working to keep the damage as limited as possible. So what have I been up to, aside from trotting around taking pictures? I am living about 10 miles south of the fire, and the wind hasn’t really blown it south much at all. However, I have still been cooking, doing dishes, doing laundry, and working in the yard. They are normal tasks, but they take on new meaning in these circumstances. A hotel room may not have a kitchenette, but it will probably have a microwave. 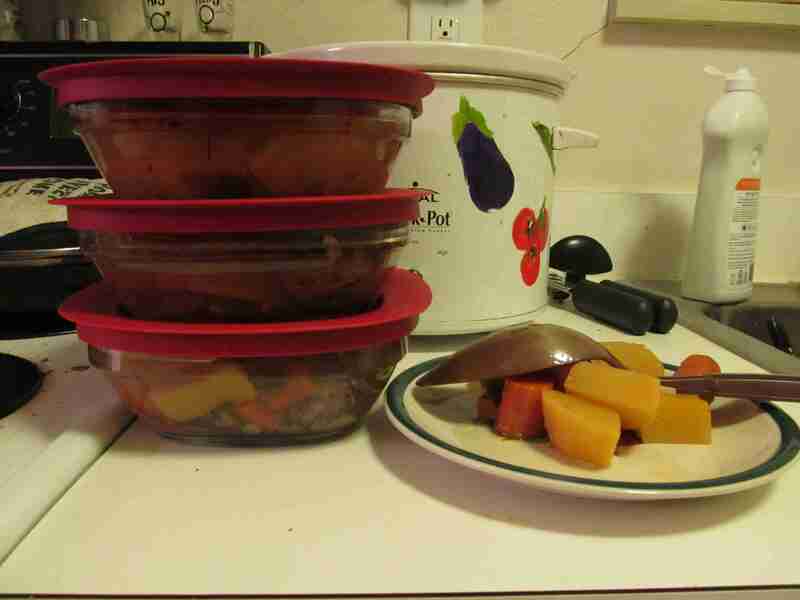 Pre-made meals mean that I can still feed myself on a budget even if I have to leave. It also means that I’m leaving less food behind to be lost. Dishes and laundry need to be kept up with so that I don’t have to do them while I’m packing my car to evacuate. Plus, I prefer to travel with clean clothes. I’ve been slowly taking last year’s dead weeds out of the yard this summer, but the task took on new urgency when the dry weeds changed from unsightly to potential tinder. I don’t want to think about the yard if the wind changes direction and we are put on pre-evacuation status. At that point, all I want to think about is getting my car packed and hitting the road before anyone else does. The other thing I am doing is planning. Last year there was one fire, and it was a bit north of us, so my roommate and I fled to Pueblo. 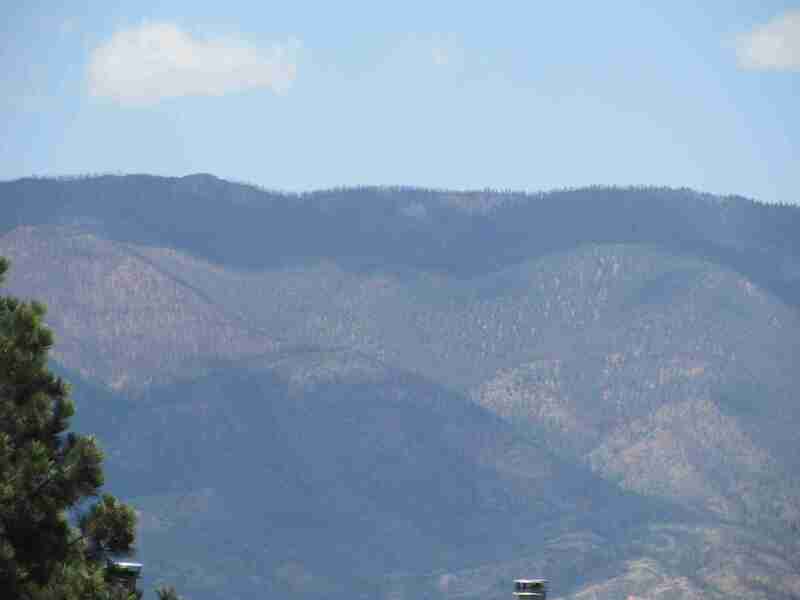 This year, Pueblo had a small fire, and the Royal Gorge Fire is also south, so that’s out. 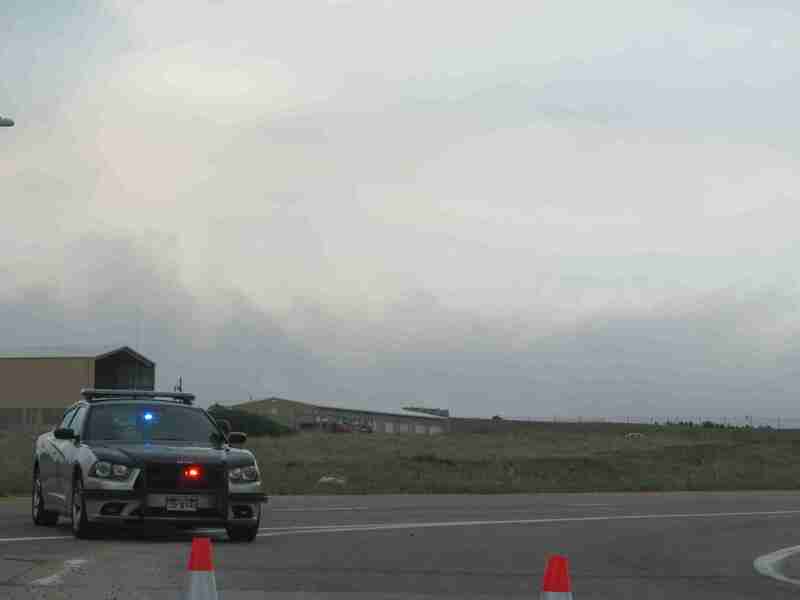 The fire is north of us, and has closed down 83, which leaves 25 as the only direct road north to Denver. Well, evacuees plus construction would make for a mess. North is out. The plan is to head east out of town. Maybe, depending on the fire direction, I would feel safe stopping in Calhan, or maybe I wouldn’t stop until I hit Kansas. To that end, I’ve been watching my gas gage, and if it hits half-full, I’ll top it off. If I have to leave, I don’t want to stop. This year I’m also much more on top of what I’ll take with me. I finally re-packed my trunk so that it held the things that I don’t use on a regular basis, but I wouldn’t want to lose. I have also made a mental note of what else needs to be taken, and in what order it goes to the car. The most important stuff gets loaded first just in case I get interrupted and have to leave now. I haven’t packed any clothes, but if the wind starts blowing this direction, I’ll do that immediately. I have no intention of waiting for a mandatory evacuation order to get out of the house. Given the wild hurricanes out east, the tornados in Oklahoma, and the increasingly early fires out here, I suspect that this is not a fluke. 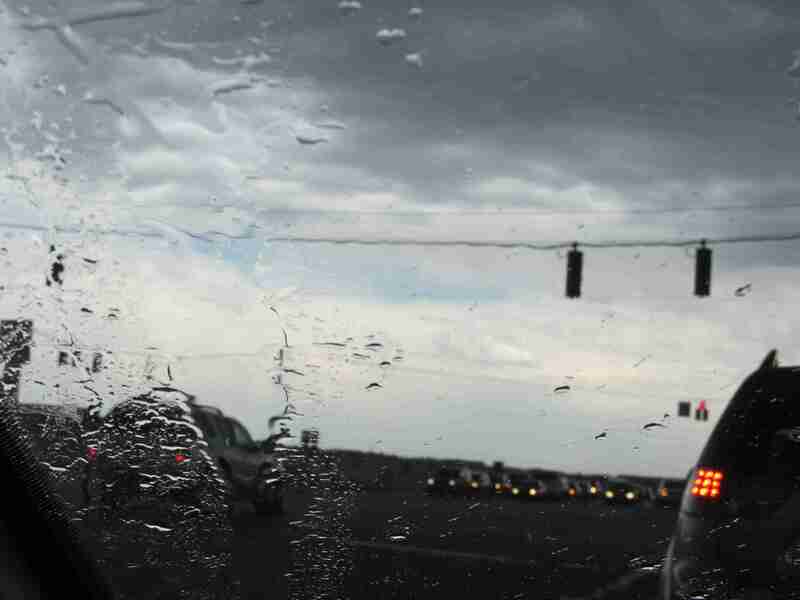 This is the beginning of a trend of increasingly wild weather and natural disasters. How fast can you get out of your house with the people, pets, and items that matter most? Will it be fast enough? During the morning briefing we were told that it was up to 15,000 acres with 360 structures lost. 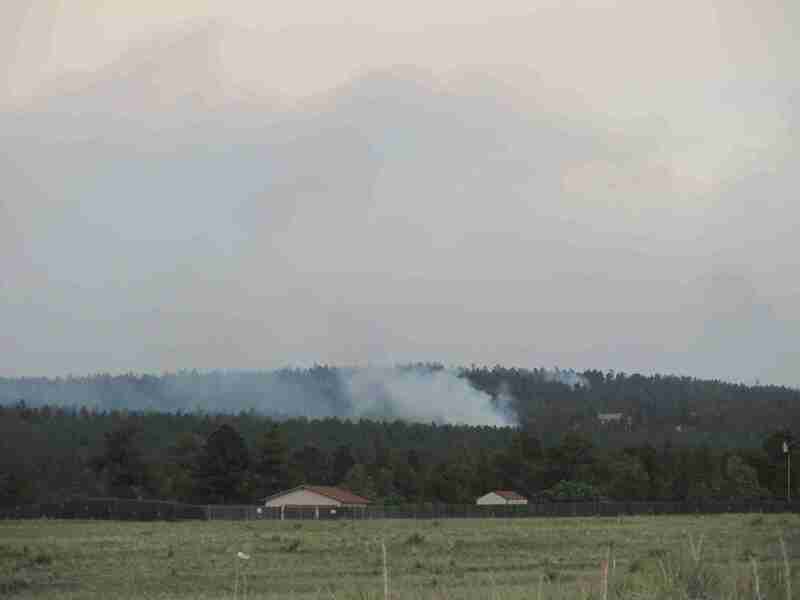 Waldo Canyon topped out at a bit over 18,000 acres and 346 homes lost. So, we beat one state record, and we’re working on the other. Yay? 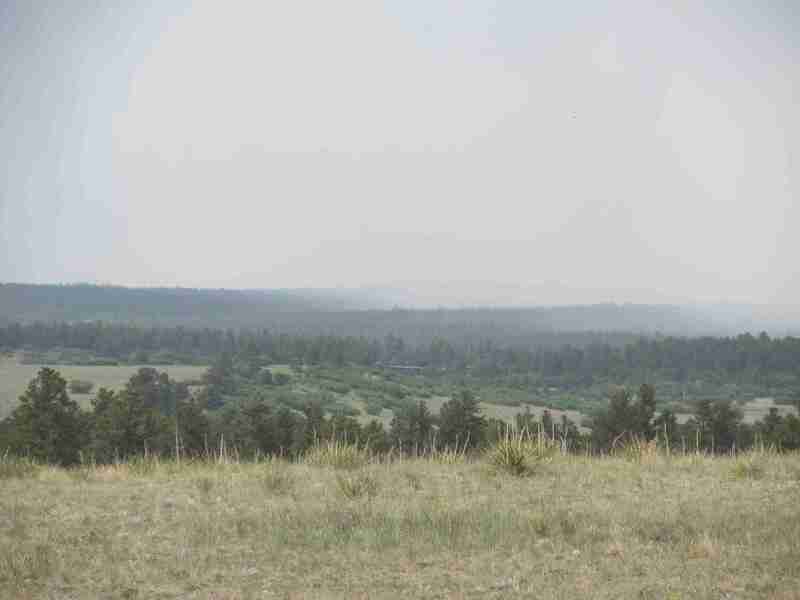 By the afternoon briefing it was up to 15,700 acres, but it looked like no more structures had been lost. We are at 5% containment. We have about 750 firefighters on the ground at the moment. I have no idea how many police, military, and others are helping out. There have been two confirmed deaths. The deceased were on the phone with people at 4:20 on Tuesday, watching the glow in the distance. At only three-ish hours into the fire, they may well have not gotten an evacuation notice at that point. Around 5 they called another person to say that they were on their way out, and they could hear popping and snapping from the fire. They were found in their garage looking like they were just about to leave. This is why when the authorities say to get out, you need to get out. The authorities aren’t allowed to grab you and bodily remove you from harm, but the fire has no such respect for your rights. 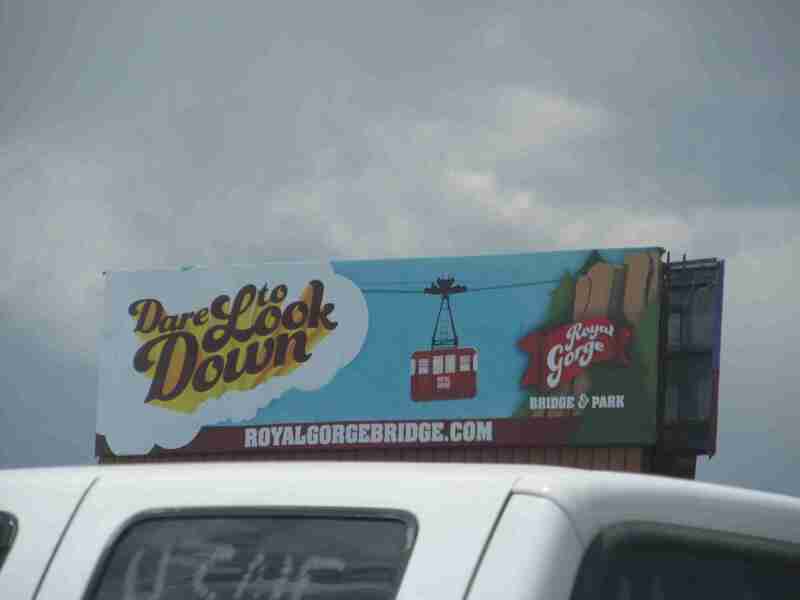 On a happier note, the Royal Gorge Fire seems to be much more under control. I had scoffed, yesterday, about them being so concerned about reopening the area for tourists. I had no idea how heavily they depend on tourists. There are about 200 people, 50 full-time and 150 seasonal, that are out of jobs. My heart goes out to all of them. That parking lot was empty, yesterday. 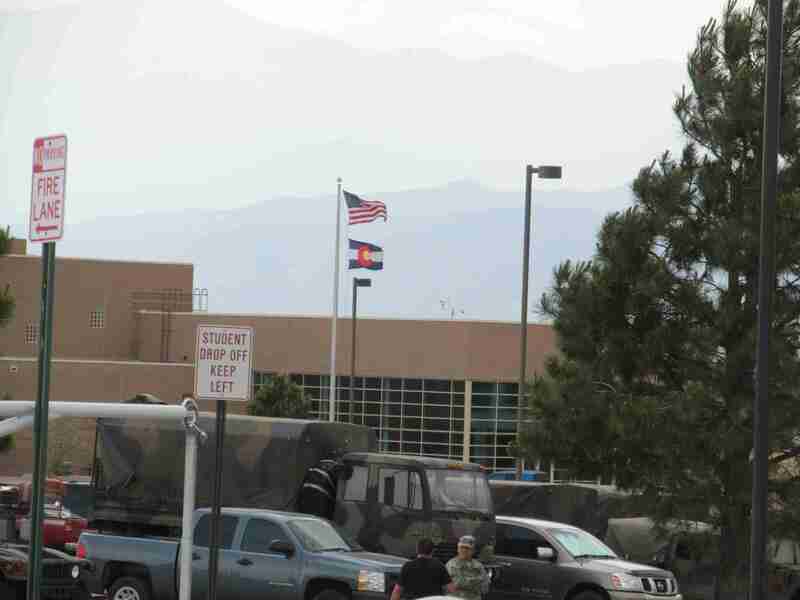 It looks like they’re setting up some sort of a staging area at Pine Creek High School. As I mentioned before, the military has been a huge boon. They are ready and able to step in to support the police and the fire fighters. They also know to take a rest when they can. The firefighters are working 12-hour shifts, and I have no doubt that everyone else is working just as hard. You can see that it’s windy and cloudy. We had a thunderstorm rolling toward us. 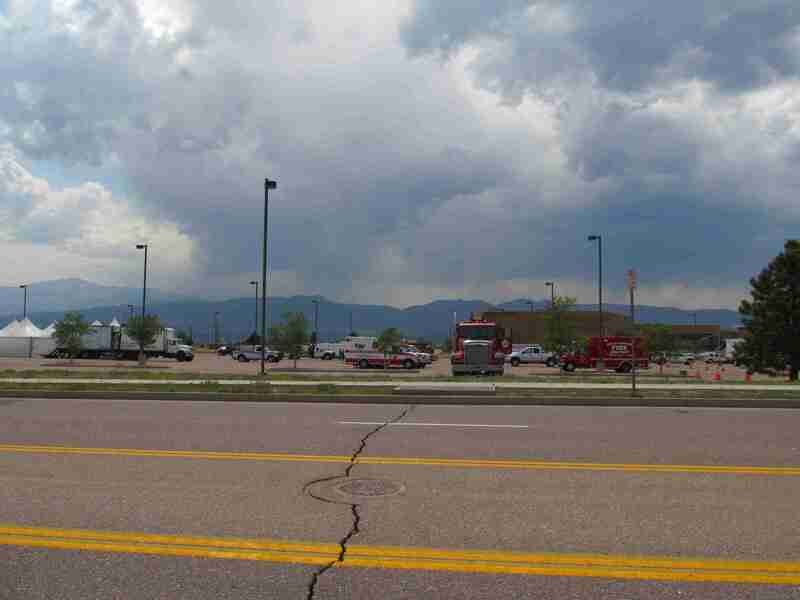 It sounds like a good thing, until you remember that it was a thunderstorm that pushed the Waldo Canyon Fire over the ridge and into Colorado Springs. 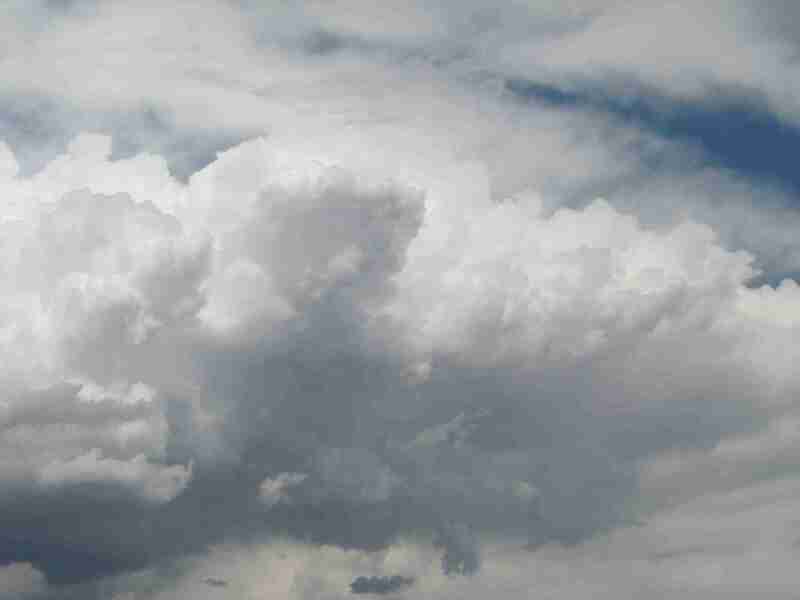 Around here, it’s very possible that a thunderstorm will not bring any rain worth speaking of but will bring gusty, unpredictable winds and lightening. We didn’t get any rain, but we also didn’t get any lightening, and apparently the cloud cover did help some with keeping a touch more moisture and a touch less heat in the air. 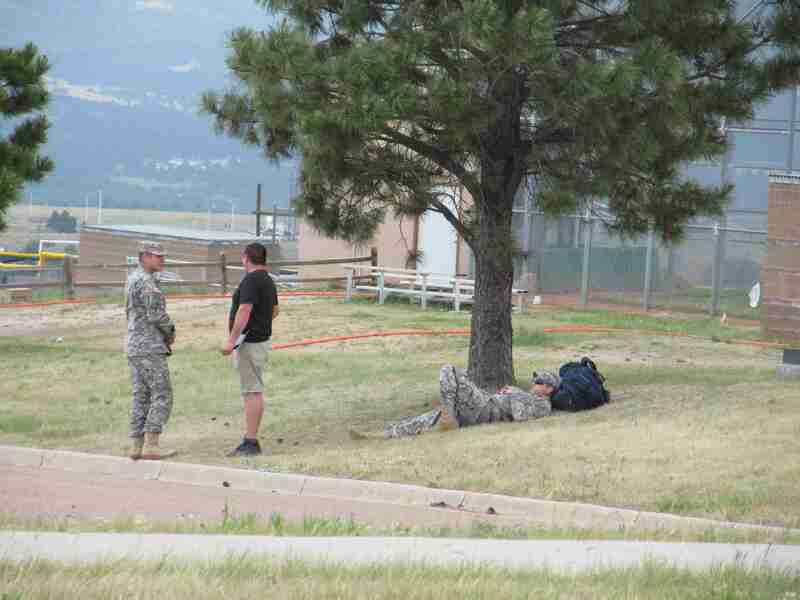 Given the heavy police and military presence, the civilians weren’t crawling through the wire fence to stand on the top of the hill. I’m sure the homeowner was happy about that. 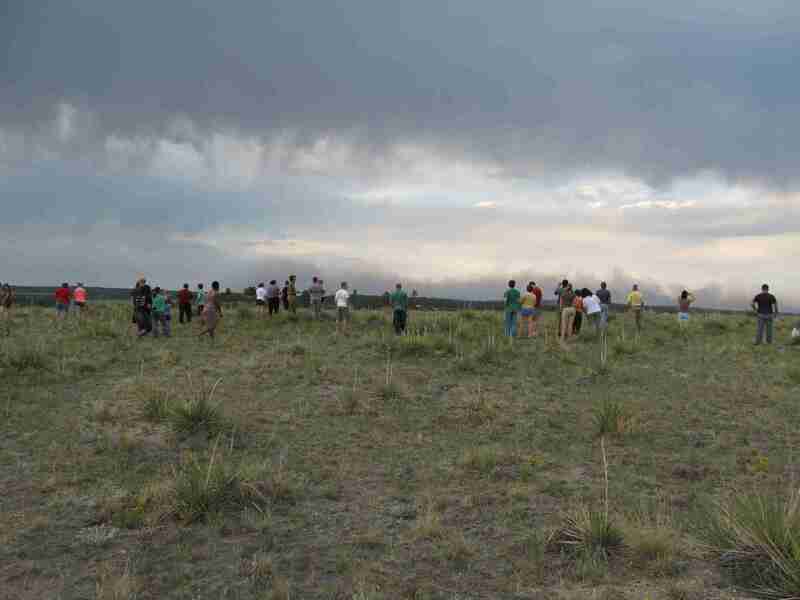 However, there were still people watching what the western end of the fire was up to. This is a “MAFFS” plane. 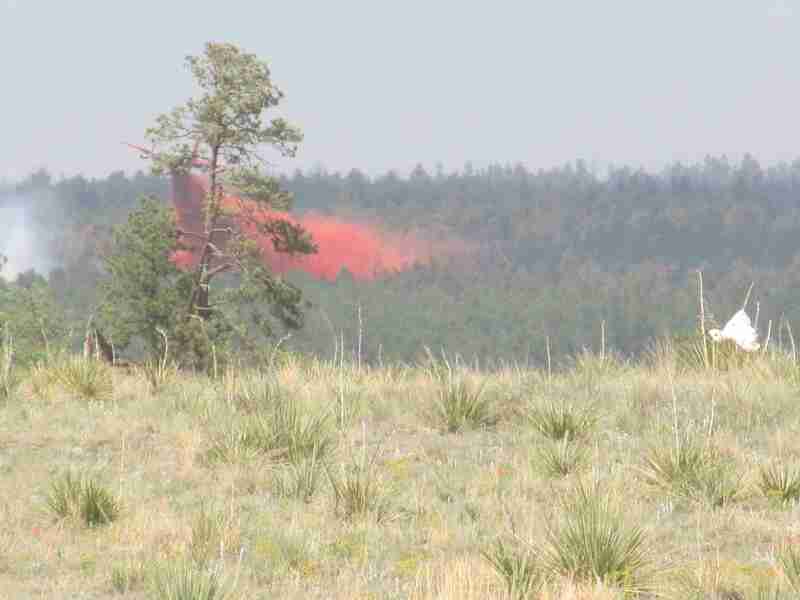 They dump 2,700 gallons of fire retardant in about five seconds. 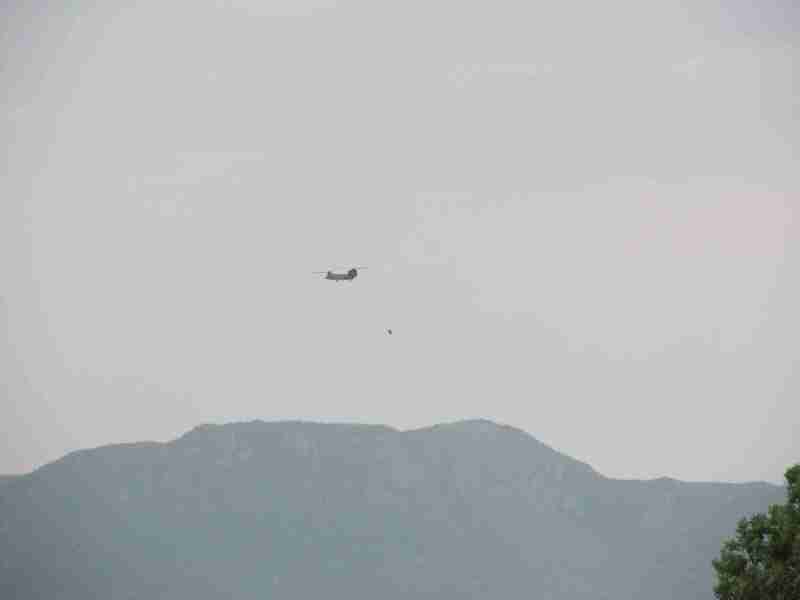 The release gives the same push to the plane as one of their engines at full power. 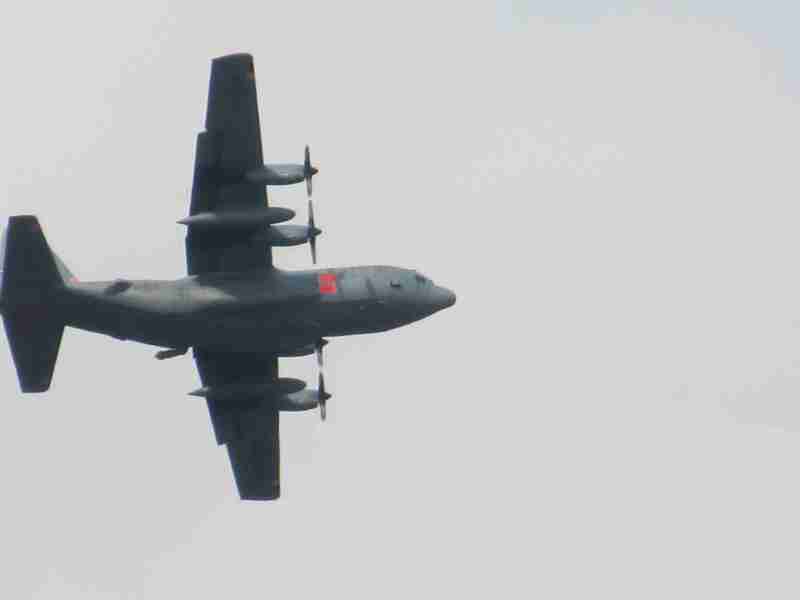 Here’s a close-up as it flew almost overhead. This one was almost an awesome picture. Darn tree. This one turned out ok, though. That red is called slurry. They have been telling us repeatedly that it doesn’t put out the fire, but it is supposed to slow it down so that the ground crew can actually get in there to stop it. You can see in some of these pictures exactly how dry our plants are. Even the yucca are looking a little tough. 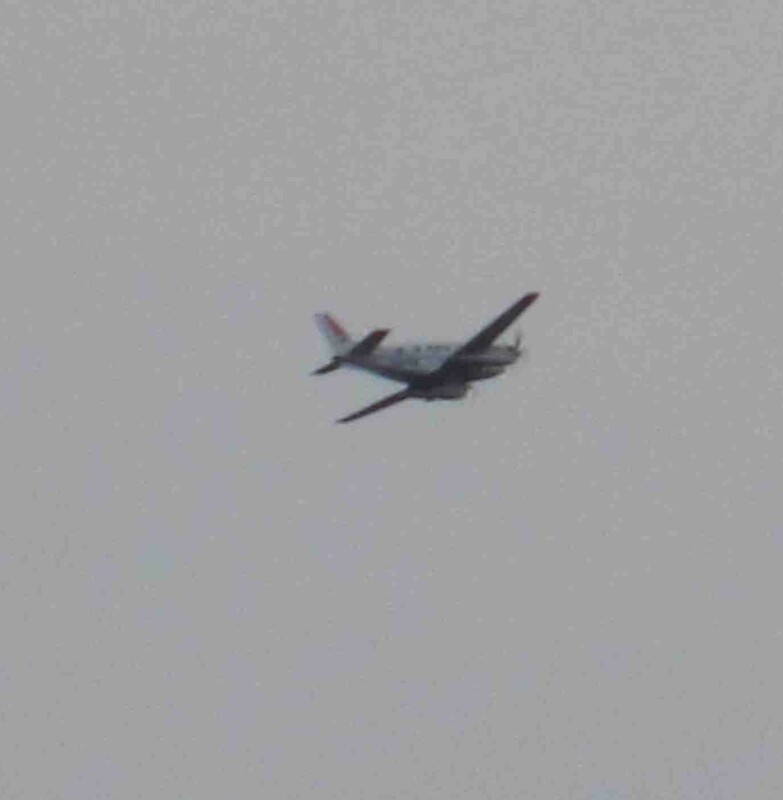 I’m guessing this was a plane used as a spotter to help direct both the fixed-wing planes and the helicopters. This is the house I saw yesterday that I thought was doomed. It’s still there! I’m used to seeing stuff like that back east when it gets misty. I don’t think I like the smoke version nearly as much. Here are some more of the first responders of one type or another. Thank you! Thank you, very much! Have you made a donation to your local food bank, yet? The easily opened tinned meat has been requested to make it easier to feed the firefighters in the field. 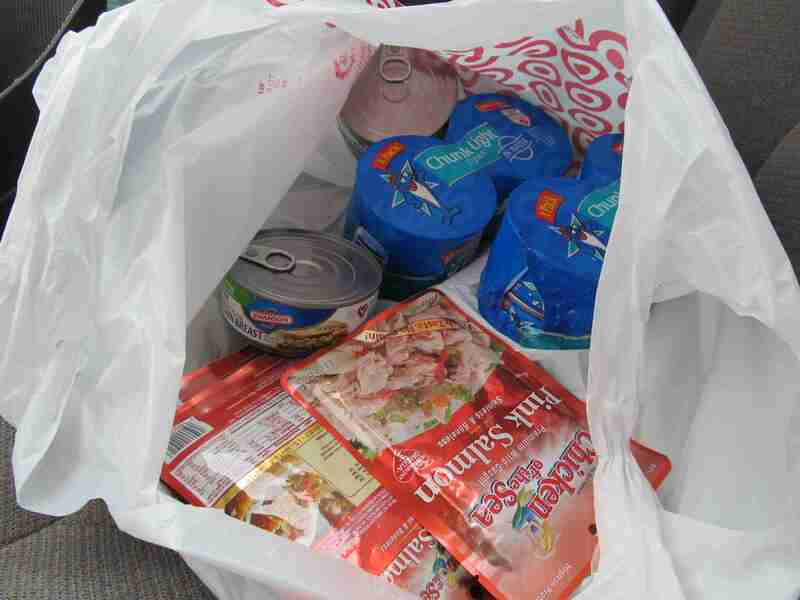 The tuna will be for the evacuees and, later, for those who have lost their homes. I had wanted to see if I could follow the southern edge of the evacuation area to see if I could get pictures of the western part of the fire. When Old Ranch Road took a 90-degree turn and I saw this- I decided it was time to go home. My state is on fire again. 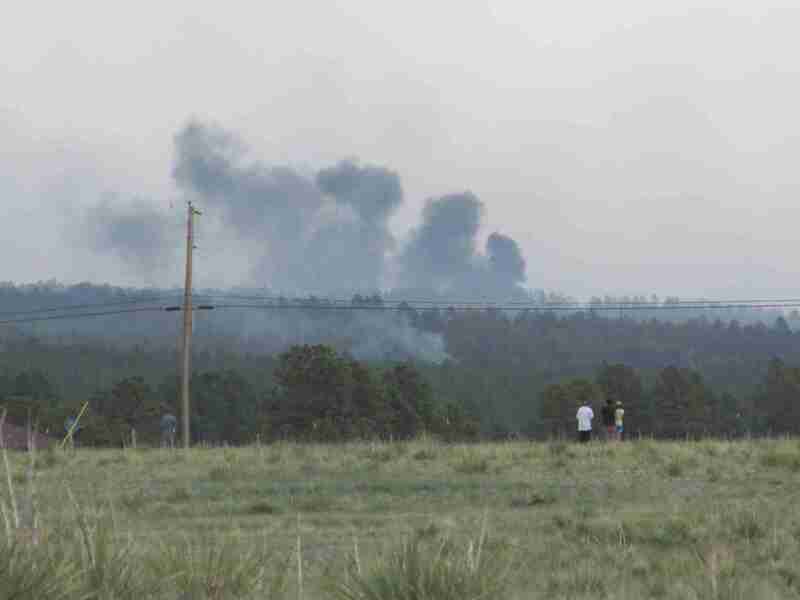 This is a week-and-a-half earlier than the Waldo Canyon Fire last year. Why is that a problem? Because it’s only mid-June. Grass should still be growing and green, but our grass and trees are dry enough to allow for raging fires. 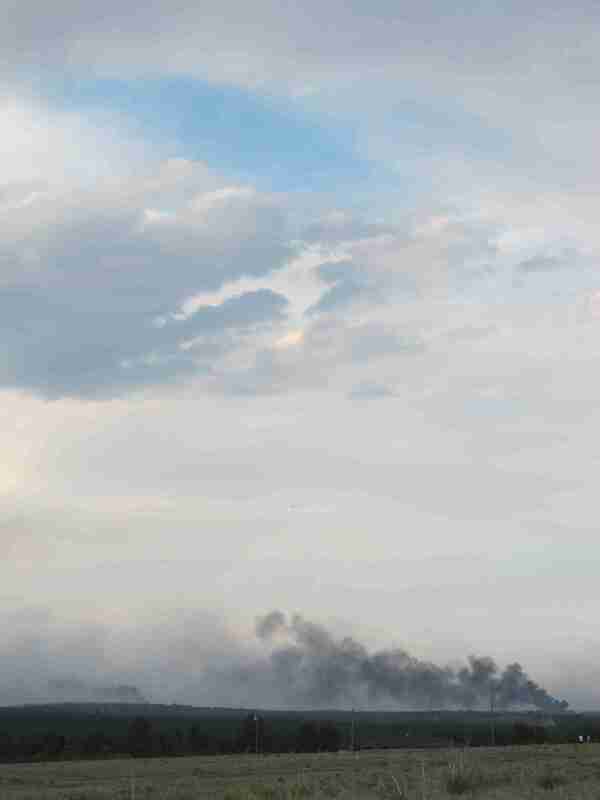 Yesterday, three fires started. 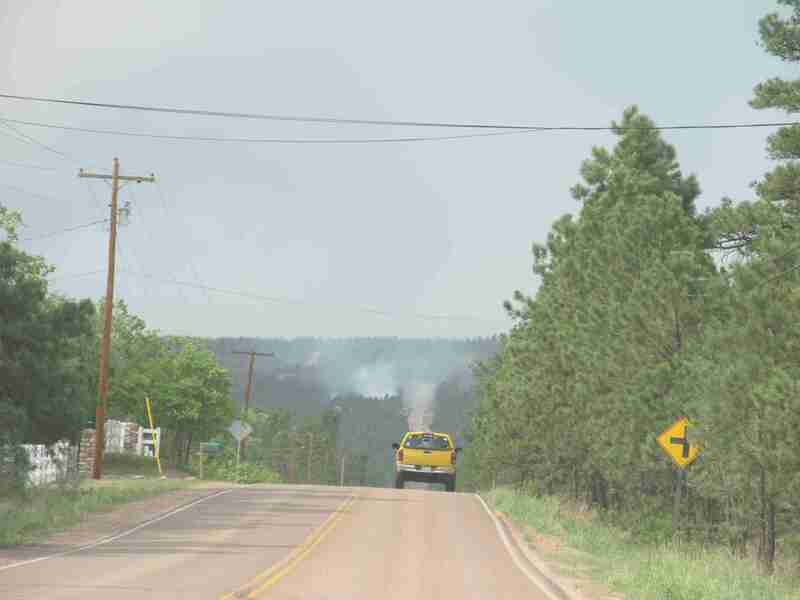 The one just north of Colorado Springs is the Black Forest Fire. 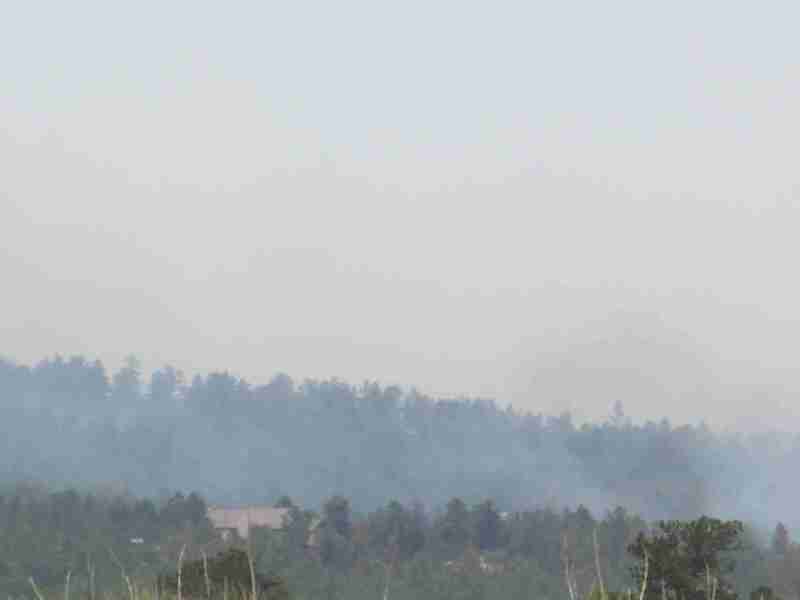 Due south in Pueblo there was a small grass fire, and south-west of the Springs, in Canon City, is the Royal Gorge Fire. Today, another tiny one sprang up to the west in Florissant. 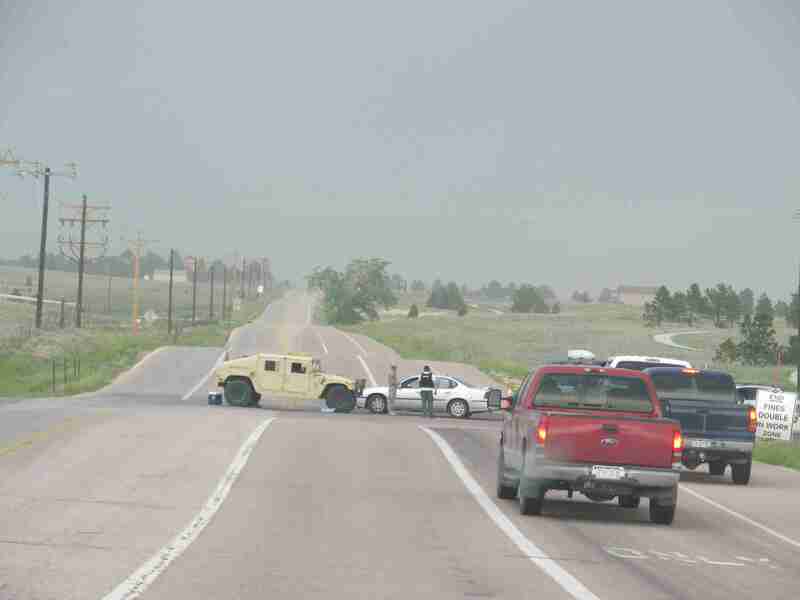 The one in Pueblo and the one in Florissant seem to be under control. 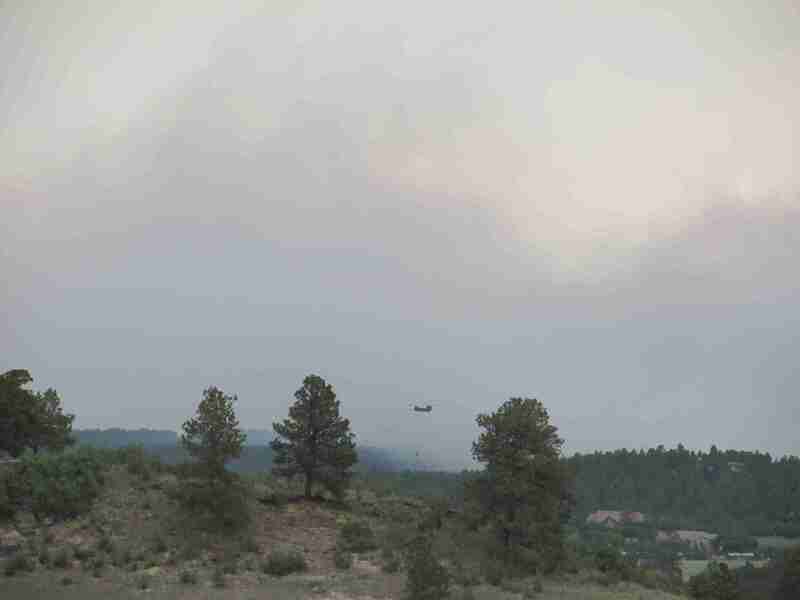 The Royal Gorge Fire topped out at 3,500 acres and as of the last update is down to about 3,000 and is considered to be 20% contained. In order to call it “contained,” they need to be sure that the fireline or other border that is established won’t be broken through. 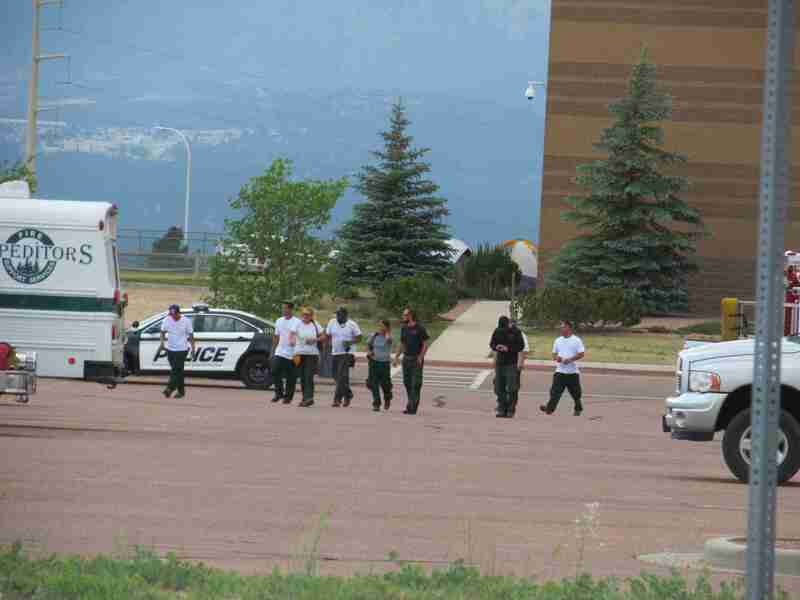 That means that 20% of the outer edge of the Royal Gorge Fire has been stopped. If it so chooses, the fire can still grow in size, since 80% of the outer edge is not yet trapped behind a border. I did find it a little amusing, though, that before any sort of containment was even announced, they were already talking about setting up a meeting to discuss how to rebound from this for the tourists. Our fire, however, simply scoffs at our puny human efforts to contain it. Apparently it went from ignition to 8,000 acres in about 10 hours, yesterday. As of the 5:00 update today, it was 11,500. I apologize for the lines in the blues and greys in the following pictures. Compressing my camera’s pictures to a reasonable size tends to mess with the gradients. While I was driving, I saw one of the helicopters on its way back to the Air Force Academy for a refill. They opened their runway to help with all of the air support. See that green tree in the corner? The haze between me and the mountains is the smoke. I also saw a roadblock. Not that I wanted to get that close to the fire, anyway. 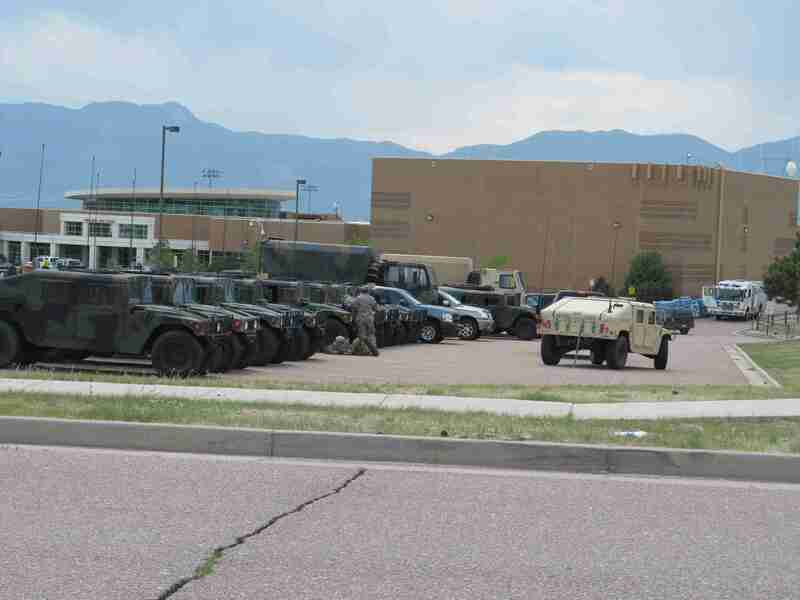 I ended up in a field near Pine Creek High School. 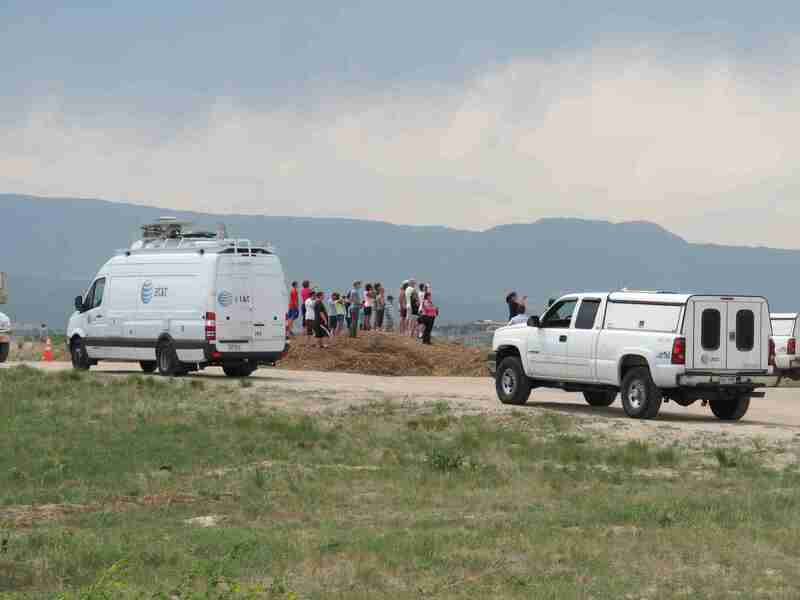 It had a great view, and it was at the southern edge of the voluntary evacuation area, which was the evacuation area the furthest away from the fire. I wasn’t the only one that wanted to see what was happening but didn’t want to get in the way of the people working their butts off to protect our city. Unlike Waldo Canyon, which was a fairly steady wall of fire, this one has a ragged edge that moves forward with spot fires. I’m kind of hoping it’s a back-fire, though. Otherwise, that house is screwed. The official count, as of noon today, was over 100 structures lost, with 92 of them being homes. It isn’t a complete count, though, as I talked to a man whose house is in the affected area but it was not on the list of lost structures or the list of ones that were unharmed. It will be a while before we can get a really accurate count. 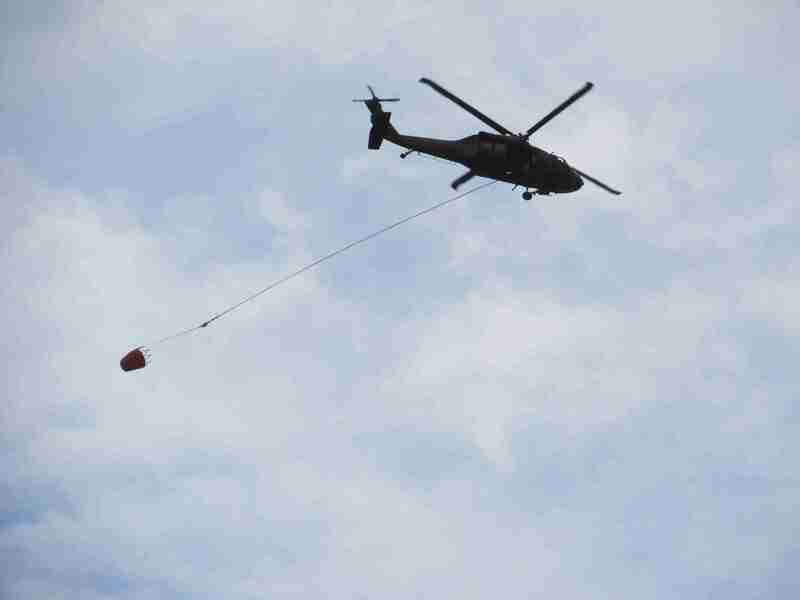 This one flew right overhead, since it was coming from the other end of the fire to be refilled at the Academy. 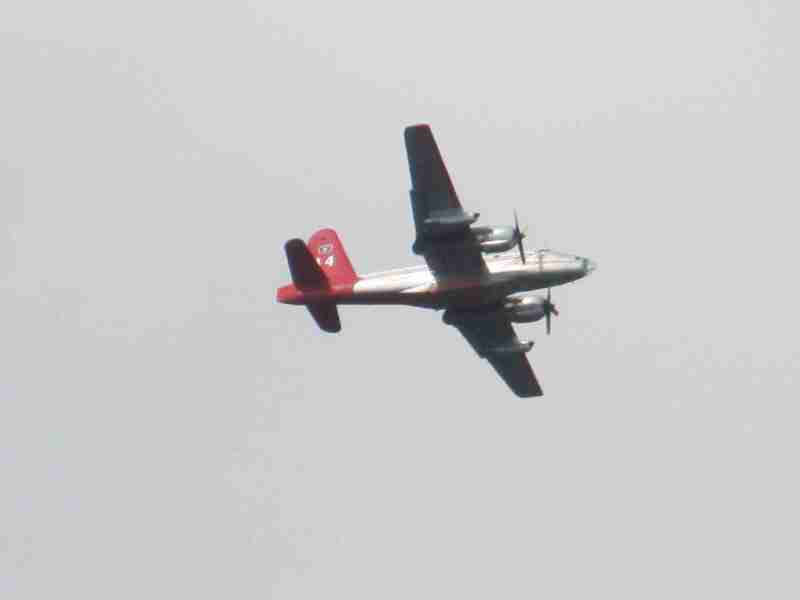 We have fire-fighting aircraft and military aircraft in on the action. There are perks to being in a military town. I think this one is even from the Academy fleet. If this dark plume is one house . . .
. . . then what the hell is burning here? 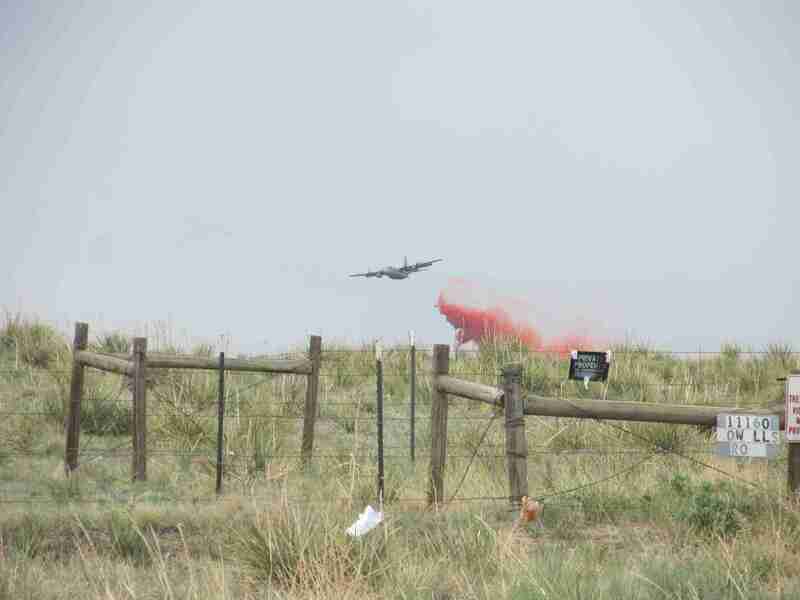 It has been quite windy today, but because the fire is more in the plains than the mountains, it is safe enough to keep the air support flying. They were mustered a whole lot faster than last year, and thank goodness, too. The area isn’t as densely populated as the Springs, but it’s not empty, either. Bright blue skies and fires. Both products of being in such a dry area. However, on a positive note, Care and Share received over 100,000# of donations of food and drink, today. I saw them put out a note that they needed Gatorade. It was only two or three hours later that they put out another note saying that they were now swamped in Gatorade. I live in a pretty awesome community.